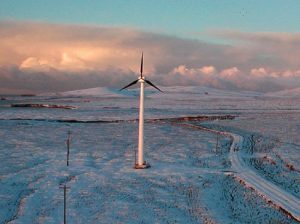 Wind-powered community microgrids are providing both electricity and heat to four small rural communities in Alaska, cutting residents’ fuel bills and reducing dependence on diesel fuel. 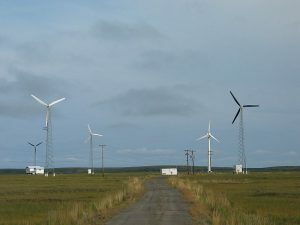 What makes the project viable is its focus on community needs beyond just electricity, said Dennis Meiners, principal of Anchorage-based Intelligent Energy Systems, a system integrator and developer working on the project along with local utilities, the Chaninik Wind Group, and the federal Department of Energy (DOE). Not only do the microgrids — which combine diesel, wind energy and in some cases, lithium-ion battery storage — provide electricity, but they also create heat by sending excess wind power to thermal heating units in the homes, basically “boxes of bricks” with thermostats, Meiners said. The excess wind power is stored in the thermal units until it’s needed. “The thermal storage units are units in residences connected to their electrical systems,” he explained. The ceramic bricks warm up to 1200 degrees. When residents need heat, they can push a button and call for heat or set a thermostat. Located in Lower Koskokwin Alaska, each of the communities has a central-station diesel power plant and a distribution network. Batteries, wind tubines and electric thermal storage are added to those plants. The project allows the local utility to sell power for heating at half of the cost of what residents were paying for diesel oil-based power, Meiners said. The DOE’s Office of Indian Energy Policy and Programs provided some initial funding in 2010, saying that the project aimed to reduce fossil fuel consumption by 40 percent and displace 200,000 gallons of diesel fuel with wind energy. “The project will benefit the tribal communities with fuel savings, increased revenues to each local utility, and reduced heating cost, as well as enable utilities and customers to control costs,” said the initial project description. One of the microgrids is in Kongiganak, where five wind turbines supply the village with about 25 percent of its power needs, and excess wind power goes to the home heating units. 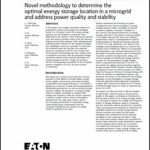 The power provided by the wind-powered community microgrids, especially with the recent addition of battery storage to some, makes the systems very cost-effective, said Meiners. “If you combine diesel with energy storage, renewables, energy efficiency and a smart grid with different pricing schemes, it’s the lowest-cost system,” he said. Meiners’ company is in the midst of adding battery storage to some of the microgrids. Over the long run, he’d like to add cooling and transportation, to the mix, electrifying the all-terrain vehicles residents use for transportation in summer, and charging them with electricity from the microgrid. “When this got started, we needed a solution that wouldn’t just address the electrical needs but also the broader needs. That’s when we came up with the idea of wind to heat with electrical thermal storage devices,” Meiners said. The DOE saw the advantage of this focus, and funded some additional work for control of the electric thermal storage units. Initially, the systems had no battery storage, said Meiners. Early on, the project relied more heavily on diesel power because the diesel engines could only be turned down so far. Slowly, the project added battery storage in the form of lithium-ion batteries. “At first, we didn’t feel there were adequate types of energy storage to turn diesel off effectively. We needed to learn how they were dispatched. We looked at installing various batteries to remove the diesel engines from the system,” Meiners said. Lithium-ion batteries worked well, allowing the project to turn off the diesel engines for long periods of time and send surplus wind energy to heat homes, he said. “Now the systems are going to be expanded. We are confident we can put in more economic and productive wind systems. We can put in large industrial-sized wind turbines and serve the whole community with renewables,” he said. Wind-powered community microgrids offer a good model for other rural communities because they involve local people — rather than out-of-staters —working together. “If you live in a small community, there’s social responsibility for maintaining the small system and doing it affordably,” Meiners said. Interested in wind-powered community microgrids? Track news about projects by subscribing to the free Microgrid Knowledge newsletter.